Those who try these different types of supplication and Islamic prayer formulas will surely understand their great value and benefit, and consequently, will recognize the great need for them. These supplications will shield one from the effects of the evil eye and will fend off its harm if the evil eye touched them, but according to the degree of faith, strength of soul, degree of reliance (on Allah) and strength of heart of whoever recites them. These supplications are types of weapons, and their effectiveness depends on the skill of whoever uses them. “I seek refuge with Allah, other than Whom there is no god. He is my God and the God of everything. I seek refuge with my Lord and the Lord of everything. I depend on the Ever-Living Who never dies. I seek to fend off the evil with: no power or strength except from Allah. Allah is enough of a supporter for me, and indeed, what and Excellent Helper. Allah is enough for me from the slaves. The Creator is enough for me from the creation. The Sustainer is enough for me from the sustained. Allah is indeed enough for me. He Who owns everything, Who grants refuge while no one can ever grant refuge against Him is indeed sufficient for me. Allah’s hearing who ever supplicates to Him is also sufficient for me. Allah, greater than Whom there is no goal to reach. Allah, other than Whom there is no god, is sufficient for me, I depend on Him (for each and everything), and He is the Lord of the Mighty Throne. Further, saying “Ma sha Allah (what Allah has willed), Laa Quwwata illa billah (There is no power except from Allah)” also helps fend off the evil eye. 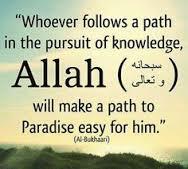 Hisham bin Urwah narrated that his father used to say, “What Allah wills will certainly come to pass, there is no power except from Allah”, upon seeing something that he likes and upon entering one of his gardens. Happy that you appreciate education, it’s indeed a great blessing. May Allah guide us and protect us for all evil.